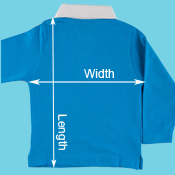 These personalised rugby shirts are coming soon and are not available for sale at the moment. personalised on the back with a name and your selected number. We are located in Sydney, NSW. This babies rugby jersey will be posted through Australia Post within 5 working days.